Between our large format graphics division, our advanced data tracking event software, and our event engineering consulting we are quite busy. We started with large wall-sized booth graphics for the new startup company ZenSpace during the ExhibitorLive Show at Mandalay Bay. Produced in a very short time, we created a pair of large back wall panels that replaced the drapes to give a massive 152 square feet of branding message on two back sections of the booth. We also helped produce a last minute short run digital print, full color brochure. The introduction of their private sound proof mini-meeting rooms got a lot of attention during the show from exhibit and facility managers. Our Assess Lead Management system has been selected to register and track all of the indoor eBike test rides at the upcoming eBike Challenge to be held inside the Minneapolis Convention Center coming up later this month. 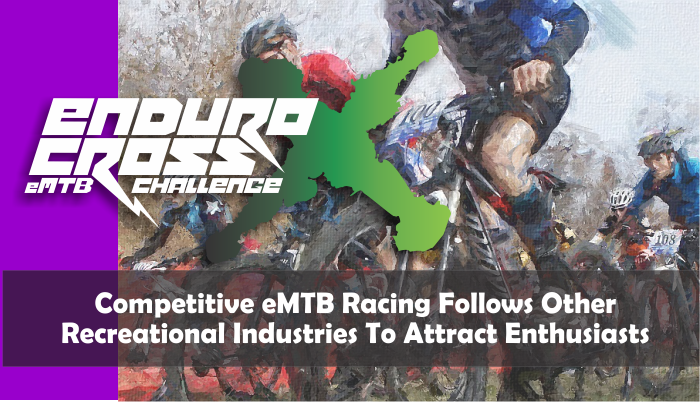 The European organizer will be using our advanced RFID tracking solution to provide select exhibitors during their first US event with complete data reports on the attendees who took their bikes for a spin. Another major government conference has ordered a large volume of big banners for the event’s back wall display. Some panels are 10ft wide by 14ft tall. The order is being produced in our Las Vegas facility and shipped to Boston and we are still competitive! Finally, our track engineering capabilities will be put to the test as we have been selected to help design, engineer, and install the new indoor eBike test track that will be part of the brand new Outside Magazine consumer event scheduled for July in the McCormick Place Convention Center in Chicago. Here we will be designing the new double-step main hill, some terrain features and the floor covering map for the event organizer. As we enter 2019, there is a tremendous amount of development energy going on in the Additive Manufacturing marketplace. The transition from the “maker” camp to actual industrial finished part production is gaining a foothold and allowing large multi-national companies to look seriously at developments that will eventually capture a significant portion of the traditional injected molded parts market, which, in 2016 was projected to be valued at 283.54 billion USD, (according to Grand View Research). The concept of using additive manufacturing as a final part production method has gained strength through three specific areas with massive academic and industrial investments in larger and faster print machine platforms, advanced chemistry to develop viable materials, and automated post-processing methods to reduce the manual finishing labor. Regardless of the planned products to be manufactured, the breadth of industries that will benefit from the various disruptive methods being developed, the most recent developments will change forever the materials used to deliver the necessary characteristics of strength, rigidity and/or flexibility, environmental durability, and complexity. The chemical composite of the latest polymers, metals, and blended filaments that combine strands of carbon, fiberglass, kevlar, and even nanotubes gives a product development team that ability to specify exacting standards of the materials used to achieve the perfect part. The additive model of layered buildups allows for the inclusion of new patented materials with incredibly high conductive capabilities. In practice, these conductive formulas allow for the printing and embedding of electrical circuitry within a printed part, linking PCBs to switches, sensors, and communications antenna. To see MIT, Harvard, and Stanford chemical engineering teams placing such an emphasis on printable solutions feeds the commercial powerhouses such as BASF, 3M, and Dow Chemical with both direction and intellectual resources. It must be said that while there is a distinct focus on IP from North American research centers and academics, similar developments are taking place throughout the EU and elsewhere. These chemically-based material solutions can allow products to be produced with specific use criteria built into specific quantity production runs. Factors of environmental extremes such as temperature, moisture, chemical interactions, and ruggedness can be addressed through chemistry blends. Making sure that structural integrity and shear force can be maximized for either frigid cold or within an engine compartment, can all be addressed. A series of new print philosophies have come out from deep cover and during the next twelve months will continue to demonstrate similar strength and finish qualities normally associated with extruded processes. Companies to follow include Origin and Evolve. Origin fits into the SLA category but has developed a method that does not rely on oxygen as an activation component in the way that Carbon and Formlabs do. According to their founder, Chris Prucha, this opens the door to a much larger materials menu due to their open material platform API. Evolve Additive has been an internal, radically new print model within Stratasys and just recently broke off to become its own privately funded company. Built around a new layered additive print process, Evolve is going directly at the injection molding industry by producing equipment that can churn out high quality finished parts that offer isotropic properties meaning that strength is now equal in X, Y, and Z axis, a problem often associated with individual layers. Printing in metal is not escaping future generation cycles with improvements coming from HP, Markforged, Desktop Metal, and the newest player Digital Alloys. Each is attempting to produce finished parts with the necessary structural integrity and dimensional accuracy that can be reproduced in volume. Here again, chemistry is playing a central role, as engineers work to develop stronger blends of metal substrates that can deliver high strength, lighter weight, and environmental durability. 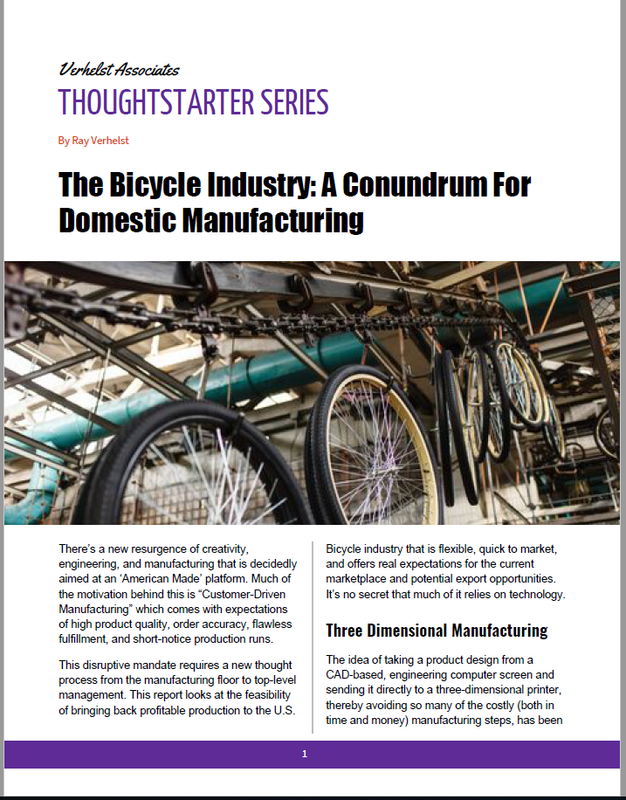 As we dive deeper into a number of manufacturing projects, we will continue to research advanced solutions that have practical capabilities for final part manufacturing, and we will publish summaries of our findings. From a practical standpoint, we will look closely at legitimate industrial systems that can demonstrate competitive solutions against traditional injection mold production and subtractive machining. Our factors will be Total Cost of Ownership for small to medium volume production runs, final finish quality as perceived from a customer’s point of view, and the capabilities of volume personalization. It’s no secret that Elon Musk’s bold commitment to deliver a line of premium electric cars, built in the U.S. has spurred on tremendous global battery chemistry and cell development. Adding to the motivation to transition away from the ICE (Internal Combustion Engine) model was the tweaked environmental testing results involving diesel powered cars, which once caught, forced German companies to commit to new alternative power-drive platforms as a form of penance. Musk knew early on that if this new commitment to alternative transport via rechargeable battery technology was going to be accepted on a global scale, both the volume of available quality battery cells would need to increase and that the technology would need to improve to deliver higher energy density, longer cycle life, and safer chemistry. He also knew that shear volume would eventually lower the cost per kilowatt hour. Following the niche sales of the original roadster, which became his proof of concept, Musk implemented the next phase of his automotive plans with his successful launch of the Model S. Originally mocked as nothing but a vehicle for the 1%, it became apparent, once the accolades were published and a demonstratively loyal fan base developed, competitors and all levels of traditional mobility platforms started to take notice. Realizing the need, Musk undertook at the time, one of his most ambitious efforts to shore up the supply chain. In a partnership with Panasonic, he set out to build the single largest lithium battery manufacturing facility in the world. Pitting states and cities against each other in a bidding war, he landed in Northern Nevada (with the help of the Governor’s Office of Economic Development) with the very first Gigafactory. To understand the size and scope, you must realize that when done, this one 4.9 million square foot facility will be the single largest structure in the world. More importantly, to outfit 500,000 cars a year, he needs an average of 7100 individual, cylindrical cells to make up the multiple battery packs in a single drivetrain. That adds up to 3,550,000,000 (3.5 billion) cells. Best of all, this does not take into account his need for his other large energy storage products. Collectively, based on a 60 hour work week, times 52 weeks, the facility needs to produce 316 cells per second to meet the auto demand. Having spent a great deal of time inside of battery cell manufacturing facilities in China, Korea, and Japan, I can say unequivocally, that collectively the whole bunch of them don’t produce that many cells in one year. The scale of the Gigafactory production lines are giant by comparison to any other cell line. The width of the rolled substrate, the double-sided coating process, the slicing and rolling equipment is on a scale never seen before. In reality, they needed to design, engineer, construct, and install equipment never produced before to accommodate the projected volume. The real irony for China, is that many of the larger commercial cell producers gave up on the production of traditional 18650 cylindrical cells, as they could not compete with Samsung, Panasonic, and LG both in quality and sheer volume. Most manufacturers transitioned to prismatic and pouch polymer cells as the new way to produce higher energy batteries. Fast forward to today and we now have more than 100 companies attempting to produce PEVs, trucks, forklifts, PTVs, boats, airplanes, and motorcycles. According to reports, as of June 2016 more than 1 million electric cars are on the road. As of the same time one year later (2017), 1.9 million cars. Between the emerging domestic market in China, and the growing competitive arena among the world’s leading automotive brands, projections indicate that by 2020, we could be looking at fifteen million units on the road. But beyond that we will see smaller, more compact personal electric transport growing at even faster rates. Reports indicate the current number of electric bicycles operating on the roads today to be 200 million, with a projection that by 2020, two billion bikes will be electrified. While the initial concepts and patents for commercial, rechargeable, lithium-ion batteries was developed jointly, by a host of academics starting in the early 1970s, in university labs in Binghamton, TU Munich, University of Texas at Austin, UPENN, Stanford University, and Oxford University. The exercise demonstrated viability, but the U.S. government did not see the commercial value. The initial patents stood, but it was Japan’s Asahi Kasei Corporation that released the first commercial Lithium-ion battery in 1991 for Sony. While there have been small incremental developments in the cell chemistry to meet the growing needs of compact consumer electronics, there was limited need to develop larger, more dense cells. It was the tried and true method to multiply smaller individual cells together into both parallel and serial connections to deliver higher voltage and larger wattage. But the higher the capacity output, the more volatile the cells became. The combination of rapid charging, blended with a higher capacity discharge to power motors and devices to greater speeds takes its toll on the internal cell structure. Anode electrodes (the negative) move towards the cathode electrodes (the positive) through the electrolyte fluids to discharge a constant output until it can’t any longer. That makes Lithium-ion cells so unique. There is very little taper, or fall-off of energy output during the discharge phase by comparison to traditional SLA batteries. During the charging of the cells, the reverse process happens. All of this movement internally, slowly damages the crystal surfaces that the electrodes attach themselves to. As the surface degrades, it holds less and less energy. As the surface is chipped away, pieces and particles create opportunities for higher heat generation which makes the cell expand under pressure. When the pressure inside of a lithium cell becomes too great, you get a process known as Thermal Runaway. The rapid heat causes the cell structure to become so pressurized that it bursts. Cylindrical cells pop open at the seam or joint where the cap meets the sidewall. Pouch cells look like the foil envelope the cheese comes in when making macaroni and cheese. The envelope expands like a pillow until one of the side seams pops open. While there is a potential for fire from within, the real issue is that the highly toxic fluids inside release super hot gases. As with virtually all larger battery packs, they are made up of a number of these individual cells. Typically, all of the cells within a pack are stored right next to each other. Most make contact on at least two sides. If one cell is defective in this bundled scenario, the heat transfers to the cells around it and force internal damage in many of them. Add into the mix leaking super hot chemicals and you have the Runaway effect. Included in all of this is the wires that connect the cells to the circuit board known as the battery management system. Three thousand degree chemicals coming into contact with wires and circuitry, makes for fires. So we know that there is a high rate of volatility inside of a battery cell with liquid electrolyte chemistry. We know that some heat is required to produce higher energy, but too much heat creates real damage. We also know that the original chemistry makeup required a fairly reactive liquid electrolyte activator to jump start the battery energy process. Higher Energy Density - Currently lithium cells in a number of different chemistries, provide between 2.9 and 3.9 volts of power. A good benchmark seems to be 3.6 volts. If cells could hold higher voltage, say 4.2 or higher, then you have a choice of reducing the number of required cells linked in series, or creating a higher voltage with the same number of cells. Higher voltage delivers more power. Greater Cycle Life - More cycles means an increase in the number of times the battery can be fully charged without showing some degradation in the output. If the battery pack has a 1500 cycle life (number of times it can be fully charged), and engineers can increase the cycles by 20%, that would add almost a full year if the pack required a full charge every day. Greater Operating Temperature Range - Cells don’t operate well in the cold. How cold depends on the chemistry makeup as well as the insulation incorporated. Temperature is especially a problem when charging. Reduction of Chemical Volatility - Making cells safer in terms of improved manufacturing quality, reduced expansion during high energy discharge, and reducing the gas generating chemistries that create the most damage during a cell failure. Reduced Charging Time - As we know, lithium batteries can charge fairly quickly up to about 70% of the capacity but the remaining 30% can take as long if not longer because the placement of the electrodes needs to find the hidden spots to attach to among the existing stored power. Pushing more into the pipe during the initial charge phase can be made quicker, but faster charging also accelerates the damage to the surfaces. Finding Alternative Chemistries - With the greater demand for Lithium, Graphite, Cobalt, Manganese, and Nickel the current resources are being acquired by nations and large corporations for both control over the flow of especially the rare earth materials, and geopolitical positions. Finding lower cost or more common options will allow a broader selection of producers to meet the growing demand. In terms of existing chemistry and form factor, Tesla and Panasonic, as well as Samsung and LG are now producing larger cylindrical cells. The current 18650 which is the abbreviation for 18mm in diameter and 65mm in length. The new format is 2170 which is 21mm in diameter and 70mm in length. Inside the cell is a 32” long copper foil substrate strip that is coated on both sides with the lithium-nickel-cobalt-aluminum oxide mix that is applied in a coating form and dried into a jelly-style paste. This is then rolled with a membrane separator, wrapped in an aluminum casing and the electrolyte activator is injected in before the cap is sealed on top. This new format actually meets the first two initial requirements. The new size delivers 30% more energy capacity and the chemistry mix provides for a reported 20% increase in cycle life. Solid state cell design addresses the volatility of the liquid electrolyte chemistry by creating a solid polymer electrolyte that can be laminated to the substrate. This reduces the flammability and allows the use of a greater selection of electrode chemistries. The solid polymer also is less affected by temperature, especially lower ranges where the liquid could freeze. We have seen where these types of cells can withstand punctures, without combustion, and still deliver 90% of their electrical output. High volume production of these cells is still a short time away but we anticipate these to be ready for applications in 2019. Battery chemistry is often dependent on rare earth materials where nation states often have majority controlling interest in the mines and processing, even if it is in a foreign land. Cobalt is a perfect example. Often listed on the Conflicts Mining Report, companies are seeking ways to avoid the child and slave labor environments often used in third-world nations to extract this material from the land. The use of iron is an example. Christopher Wolverton, professor of materials science and engineering at Northwestern University has been working with iron phosphate but it also requires oxygen which is the real challenge. Computer models show promise and early stage prototypes are helping to prove the practical side. Engineers at Penn State has devised a pre-heating function made of nickel foil that is linked to the battery management system, which includes a temperature sensor. The system detects when the cells are below room temperature and uses a small amount of energy from the charger to heat the cell back to above room temperature through foil and then introduces the charge. The use of Graphite as part of the chemistry mix has added real storage capacity benefits. Universities are working on synthesized porous carbon that when compared to graphite, can hold 2x the amount of lithium-ions allowing the cell to charge quicker. Blends of super and ultra-capacitor cells into traditional lithium battery packs have demonstrated the ability to incorporate a 2-stage charge process to where the capacitor cells charge almost instantly and then feed the traditional lithium cells are the rate they can accept. At the same time, the ultra-capacitor cells can deliver a much higher discharge rate under full demand. Everyone from computer chip makers, to electric drive controllers are seeking ways to produce more efficient IC that uses less power to do more. The use of thinner circuit boards, carbon nanotubes, and denser circuits on a single chip have yielded an average of a 22% reduction in power consumption each year. Software is also an important tool to conserve power. Applications that build an AI user profile and control power consumption to meet the individual user’s needs is a way to reduce power and keep a necessary reserve based on historical needs. ​It seems that Musk is about to finalize his second Gigafactory somewhere in Germany, but the EU is not waiting and has built a consortium of leading automotive manufacturers to develop their own production lines. China is also mobilizing its cell manufacturing capabilities but is still behind in terms of advanced large capacity cell production and a weak IC production capability to produce battery pack management solutions. Yet, with one of the largest economies for urban personal transport, they have the biggest incentive to succeed. Each group will invest in promising research to vet out the possible chemistry alternatives and improved formats. Lithium is like clean water and both are quickly becoming the new petroleum.